One of the fastest and most powerful ways to boost content efficiency and leverage the re-usable content connected to your Qorus Hub, is to use the Insert. Qorus offers multiple insert options, and you'll find them all listed below. If the content you insert contains Smart fields and rules, then you will be presented with a form that allows you to very quickly personalize the content you insert. You can learn more about inserting smart content here. The content insert options available will vary based on the file format of that content. The insert options, as well as some of the insert behaviours, will also vary based on the Office 365 app you're working in. For instance, the insert option 'Insert as refreshable' is only supported in Word, and is not available in Outlook, PowerPoint, or Excel. Click below to learn more about the file types supported by each insert option, what happens when you use these options, and where you'll find them in your Qorus Add-ins. 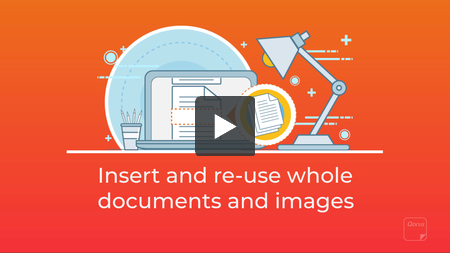 'Insert' takes the whole body of contents of a file, and inserts into emails, documents, presentations and spreadsheets, wherever the cursor of your mouse is positioned. If you work with Word documents that have different layouts, themes and styling, and you insert the contents of one document that has one set of styles applied, into another document with a different set of styles applied - the inserted content's formatting may change to adapt to the destination document. You can control this behaviour to a certain extent with Word's copy and paste options. Also, you'll get the best results, if you style your documents using Word styles, rather than applying formatting directly to text. The types of files that can be inserted using the 'insert' button, include: Word documents, text files, html files, SharePoint Online list items and images. 'Insert' is available in the following Office Apps: Word, Outlook, PowerPoint and Excel. This feature is only available in Qorus for Word, and works hand in hand with 'Refresh' and 'Finalize'. 'Insert as refreshable' is the same as the 'Insert', except that using this option allows you to keep the Word content you insert in documents, in sync with Word content you manage in OneDrive for Business and SharePoint Online. If the document you 'inserted as refreshable' into a document is later updated in SharePoint (after you've inserted it), you can use the 'Refresh' to automatically update the content inserted into your document with the latest changes. 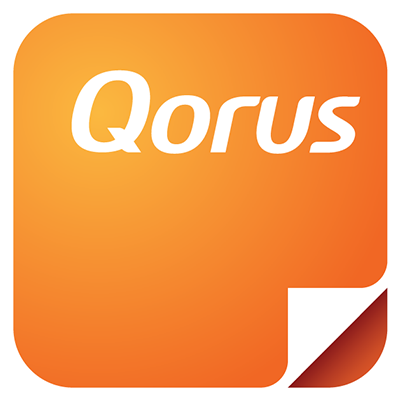 Please note: Qorus Admins have the ability to turn the 'Refresh' feature on or off for your Qorus Hub. If the 'Refresh' is disabled, you won't have the ability to 'Insert as refreshable'. The types of files that can be inserted using the 'insert as refreshable' button, include: Word documents, text files, html files, SharePoint Online list items and images. 'Insert as refreshable' is available in the following Office Apps: Word only. When you expand a search result, Qorus will display a thumbnail preview of the file in the Search pane. The 'insert displayed item as an image' takes whatever is showing up in the thumbnail preview, for instance a page in a document, and inserts it as an image. The types of content that can be inserted using the 'insert displayed item as an image' button, include: pages from Word documents and from PDFs, as well as slides from PowerPoint presentations. 'Insert displayed item as an image' is available in the following Office Apps: Word, Outlook, PowerPoint and Excel. This is the same as the 'insert displayed item as an image' option, with the difference that you can select multiple pages or slides to insert as images at once, rather than one at a time. You'll find this option in the Gallery preview. This behaves in exactly the same way as the 'insert displayed item as an image' option. You'll find this option under the Full Page Preview. The types of content that can be inserted using the 'insert current item as an image' button, include: pages from Word documents and from PDFs, as well as slides from PowerPoint presentations. This behaves in exactly the same way as the 'insert' option. You'll find this option under the Full Page Preview. The types of content that can be inserted using the 'insert all' button, include: Word documents, text files, html files, SharePoint Online list items and images. 'Insert all' is available in the following Office Apps: Word, Outlook, PowerPoint and Excel. When you're working with the Selectable Preview, you can click inside the preview window, interact with your content and select the content you'd like to re-use. Once you've made a selection, the 'Insert selection as rich text' button will light up in orange, and clicking on that will insert the selected content in rich text format. With this option, some formatting like paragraphs, bullets and headings will be retained in the destination document. The types of content from which you can select text and then insert your selection using the 'Insert selection as rich text' option, include: Word docs, PowerPoint presentations, Excel spreadsheets, PDF, SharePoint Online list items, and email .msg files. 'Insert selection as rich text' is available in the following Office Apps: Word, Outlook, PowerPoint and Excel. This is almost the same as the 'Insert selection as rich text' option, except that the selected text gets inserted in, well, plain text. With this option, none of the formatting of the selected text will be retained in the destination document. The types of content from which you can select text and then insert your selection using the 'Insert selection as plain text' option, include: Word docs, PowerPoint presentations, Excel spreadsheets, PDF, SharePoint Online list items, and email .msg files. You can insert SharePoint Online or OneDrive for Business links in your emails, using the Qorus Add-in for Outlook. The recipient of the email will be able to access the file, provided that they already have permissions to that file. In other words, this is a lot like copying and pasting a link to a file in an email. It does not grant permissions to the file in any way, and is best used to share file links with other people on your team. You can use this insert option with all file types. 'Insert link' is available in the following Office Apps: Outlook only.